KMT Waterjet provides reliable installation parts for the efficient installation of high pressure pipeline systems for waterjet cutting. Catering for rated pressures of up to 6900 bar, our product range covers all applications in the field of waterjet cutting. Safety is of course a key aspect for the development of KMT installation material, as all parts must be able to withstand the high pressure in the supply system. Durability, high availability and reliability are the main factors here and have therefore been laid down as mandatory criteria for the product range. Our installation parts were developed in response to demands from our customers. 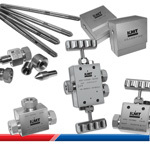 Their design is based on the experience of KMT Waterjet in ultra high pressure applications acquired over many years. With the introduction of the STREAMLINE PRO pump series, which is able to generate pressures of up to 6,200 bar, the industry has begun to distinguish between two separate standards, for 4,150 bar and 6,200 bar applications. KMT Waterjet provides parts and solutions for cost-effective yet reliable and highly available pipeline systems for waterjet cutting units. In the production of installation parts for the various applications, KMT relies on the latest technology. 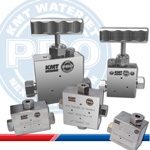 Original KMT installation parts are designed for use under extreme conditions and are also suitable for retrofitting in existing units. All parts are designed according to the latest standards, made from high-quality material and manufactured on modern production lines.